Defending Olympic champion and 110m hurdles world record holder Liu Xiang will be at the centre of an unprecedented media glare at the Beijing Games for he will be the talisman of China's hopes and dreams for 2008 and beyond. Liu was the first Chinese male to win an Olympic track event with a fairytale breakthrough win at the 2004 Games, where as a virtual unknown in Europe he claimed gold with a poetry-in-motion, world record-equalling 12.91sec dream run at Athens. In July 2006 he shattered that world mark previously shared with Britain's Colin Jackson which had stood since 1993, by three-hundredths of a second to establish the current record of 12.88sec at Lausanne. He also showed his is in top form heading to his home Games by taking the world indoor title over 60m with a blistering run at Valencia in March 2008. On the outdoor world championship stage Liu took bronze in Paris in 2003 behind Americans Allen Johnson and Terrence Trammell, while in the post-Olympic 2005 event he claimed silver when France's Ladji Doucoure beat him to the wire in Helsinki. At Osaka in 2007 he finally became world champion despite having to live with intolerable media pressure, getting off to a slow start and breaking the golden rule by looking across at his rivals before the finish. With rivals Johnson and Dominique Arnold missing the world championships, and title defending Doucoure crashing out in the semis, the race had been Liu's to lose. But Liu trailed Trammell over 50 metres before clawing his way to the front, scattering the penultimate hurdle and taking a lingering look across the track as he crossed the line. Chinese officials are afraid all the glitter that goes with this may destabilise their star man. But Liu, who signalled a changing of the guard in 2004 when he beat his former idol, the American hurdling great Johnson, says he has the focus to equal Johnson's longevity as well. "I've already decided - the 2008 Beijing Olympics won't be the end for me. 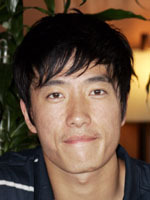 I also want to compete in the 2012 London Olympics and keep running past the age of 30," Liu told the Beijing News. Liu attacks with the left leg, shaves the hurdle and gets his foot down fast, some observers say he almost dances between obstacles. Second only in earnings to NBA Houston Rockets star Yao Ming for commercial endorsements for Chinese sports stars, Liu is the face of Coca-Cola, Visa credit cards, Nike sports gear and EMS express delivery service and complains about the time he has to spend earning these millions. In 2006 the then 23-year-old signed an endorsement with a Shanghai real estate group in exchange for a luxurious four-bedroom apartment which he then gave to his coach, Sun Haiping in thanks for guiding him to his explosive success.